October has been a wonderful month, mostly because Pete and I spent two and a half glorious weeks on holiday in Japan. We had a magical trip, which I’ll be sharing with you over coming weeks. Our trip gave me the idea for October’s BSFIC theme – frozen treats inspired by Japan. 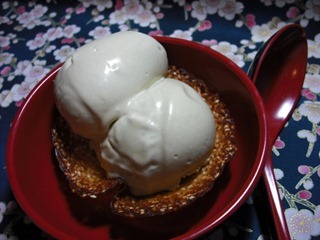 You had the choice of using Japanese ingredients as flavours for your ice creams, or presenting more familiar flavours in ways inspired by Japanese food or culture. Foodycat Alicia was the first to make a move. First, she attempted a creative dessert sushi roll with a toasted sesame wrapper around a rice pudding ice cream with a core of mango puree. It didn’t quite go to plan, though I agree with her that the idea is a good one. I wonder if freezing the fruit puree into a thin sausage, then inserting that into the rice pudding mix and freezing that, in turn, into a log shape, before finally wrapping the frozen log with the sesame sheet might work? Undeterred, Alicia changed direction and made a green tea ice cream with a condensed milk base, which she served in ginger sesame snap cups. Looks really smooth and very delicious! Sandi aka the Kitchen Princess, was also inspired by sushi, but this time nigiri sushi rather than sushi rolls. 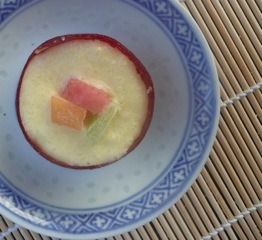 For the nigiri sushi pieces she made mochi covered with fresh fruit, which she served on a cucumber, melon and sake granita. 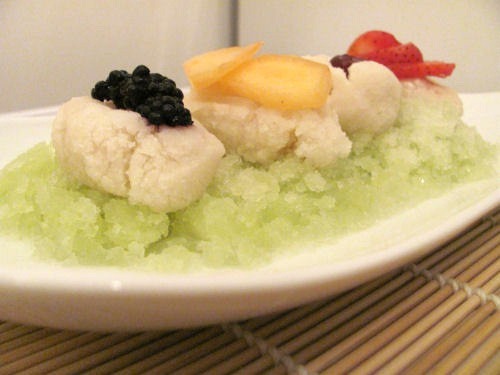 Her mochi didn’t come out quite as she’d hoped, because she was not able to get the proper glutinous rice flour required, but she highly recommends the granita as a refreshing palate cleanser or light dessert. When I announced the October challenge, I promised a prize to my favourite entry, a little something I picked up in Japan. However, with just four entries, I’ve decided to send out a little something to all four of you. Please can you drop me an email or twitter DM with your postal address so I can organise? Thanks! And I know some of you planned to enter but ran out of time. I hope you’ll still go ahead and make and blog your ideas? I’d really love to read about them. Keep your eyes open for November’s BSFIC, announced on the 1st of the month. 9 Comments to "Bloggers Scream For Ice Cream: October Roundup"
I LOVE all the sushi – the nigiri in particular are gorgeous! None of your ideas would have occured to me. If I’d been home and had time to participate myself, I’d have gone with a Japanese flavour, probably black sesame (which I love) or maybe roasted tea. 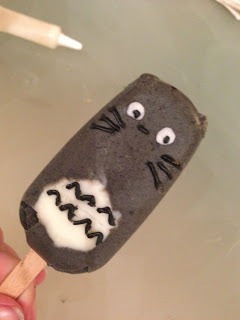 Black sesame Totoro! How adorable. Everyone has been so creative. The lolly is brilliant. Love all four of them! 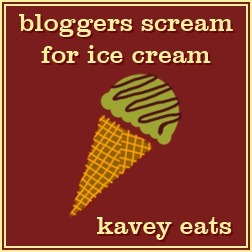 I’m always amazed by how creative food bloggers are. So much inspiration! Yes, they really pull amazing things out of their hats, eh? !